Quiet and Comfortable – What’s Wrong With That? There’s no doubt about it, life in the ‘van’ is infinitely more comfortable than camping. No tent to erect, no beds to make, hot and cold running water on demand and, most important of all, a large fridge to keep all that nice wine and beer properly chilled. I’m not at all sure how we’re going to cope if we have to revert to spending nights under canvas with the ‘Tufty Club’. Still, life is full of compromises – so perhaps we’ll just have to get used to occupying our ivory tower and be content to feel superior when necessary. First stop on our Welsh itinerary was Powis Castle and gardens which proved to be a very worthwhile stopover. In the care of the National Trust since 1957 the castle has been in continuous occupation since the 13th century and was formerly the home of the Herbert family whose alumni, we learned, included Clive of India. 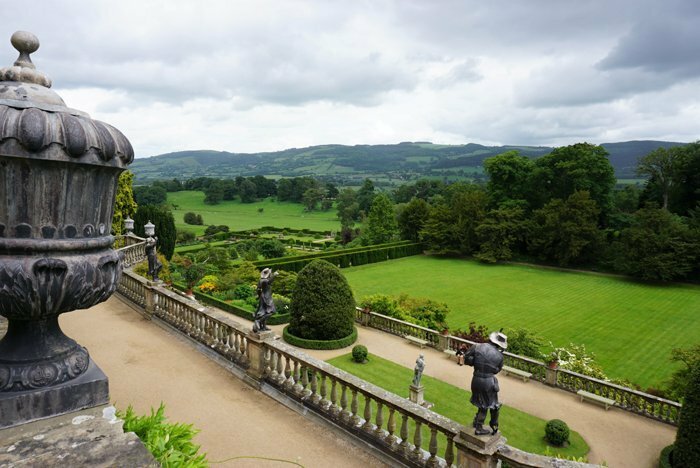 The house/castle is fascinating (made even more so through the efforts of the many enthusiastic NT volunteers who were on hand to answer our questions) and certainly worth a visit …… but the gardens are simply sensational! Ah! So that’s where the gardeners were hiding! Timing, of course, is everything and I think that we probably judged our visit to perfection. Just about everything was in bloom and, although we didn’t actually see any gardening staff at work, there must have been dozens of hard working horticulturists running ahead of us just making sure that everything was perfectly prepared for our visit. Highly recommended and perhaps even worth a return visit at some time in the future. Our second night’s stopover was at Tal-y-bont, just north of Barmouth on Cardigan Bay. With more holiday homes to the acre than it’s possible to calculate without using an abacus this type of location probably wouldn’t be our first choice in high season, but outside the school holidays there’s nothing more raucous about most of these sites than the sound of pensioners gently snoring their way through Coronation Street or Eastenders. It seems that quiet and comfortable has got to be the way forward.